When I was little, Christmas was marshmallowy moments of pure happiness sprinkled with glittery anticipation. It was thrilling like nothing else. I’d count down the days as soon as Thanksgiving hit, growing more and more excited with each X on the calendar. I’m sure it drove my mom crazy since now my daughters constantly ask if Christmas is here yet, thus making me totally insane. 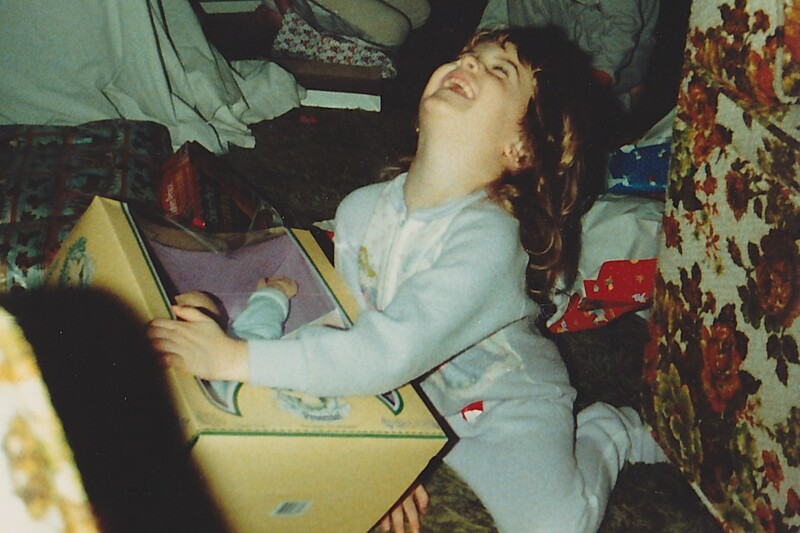 We all remember at least one Christmas that blew our minds and made us scream with pure joy. For me, it was when Santa left $3 in my stocking. I couldn’t believe how rich Santa was to leave me three. whole. dollars. Who knows what I even did with all that cash…probably blew it on candy. And to think those three dollars were probably a last minute idea on my father’s part when he felt like the piles and piles of presents he already got us weren’t enough. I totally get that now. More than all the toys, I hope we’re giving them magic, the kind they unwrap and keep in their hearts, the kind that will always bring them happiness. I want them to feel the wonder of a holiday that’s about so much more than the things they asked Santa for. Christmas is going to change for them as the years keep coming, but I always want them to feel that certain spark of excitement because I realize we don’t get enough of those as we get older. I’ve given birth for the third time! It doesn’t have ten fingers and ten toes, or a perfect button nose. It’s not a boy or a girl…it’s a BOOK! And to get it out into the world was nothing short of a miracle. I’m not claiming to be a parenting expert, but I’m sort of an expert when it comes to delivering babies and punchlines. I much prefer to deliver the latter even though it’s not easier, and sometimes it’s just as painful, but it’s rewarding in very similar ways. While I normally feel bad for babies born in the month of December, I’m super happy that my baby is just in time for Christmas. Just in time to be stuffed into every stocking you come across. Because who doesn’t want to wake up on Christmas morning and laugh about parenthood? The book is a best-of collection of my funny-because-they’re-true tweets that perfectly sum up parenthood. 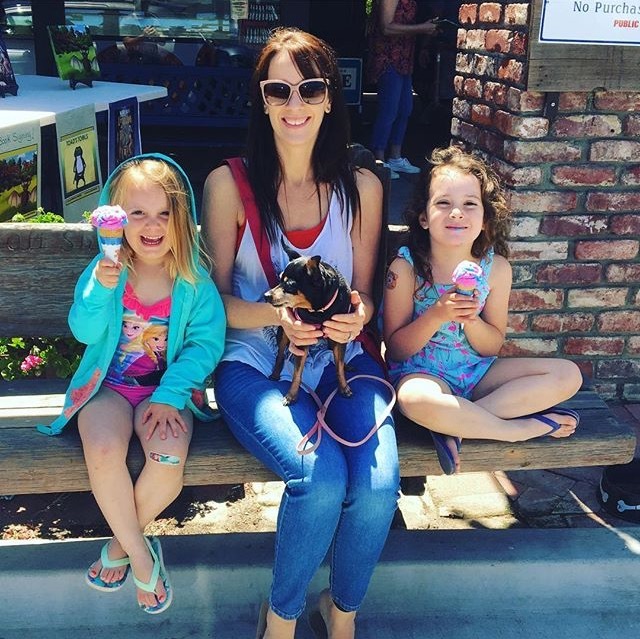 Get yourself a giant cup of coffee, (or a giant mimosa) settle into the couch that’s covered in shredded wrapping paper and plastic packaging, and read the whole thing while the kids play with their new toys. It’s the perfect gift for anyone who likes to laugh or needs to laugh, but doesn’t have a lot of time to read anything longer than a sentence (ahem, that’s everybody these days)! You’ll feel great knowing you did your part to spread a little holiday cheer this season, not to mention, you’ll be my favorite person ever. Plus, if you don’t buy my book it’s like saying my baby is ugly…and you don’t want to be that person. But I care. A lot. Just the other day my husband and I received the highest compliment you can get as parents of young kids. A woman sitting near us in a restaurant said that we had lovely children who were so well-behaved. Granted, she might’ve had a little too much vino and we had only been there about 20 minutes before she left, so she saw them in their prime–while the crayons were still keeping them busy and the sugar from their chocolate milks hadn’t kicked in yet. Nonetheless, I stood up to accept my parent of the year award and to make a heartfelt speech about sacrifice and selflessness to our fellow diners. Kidding. We thanked her and then snickered that boy had we fooled her. Why should I care what this complete stranger thought when I know my kids are well-behaved? I’m well aware of what it’s taken to make them this way–most of my sanity and all of my patience. At least in that moment it felt like my hard work had paid off. I guess that’s what I was thanking her for…for noticing. I have so much I want to accomplish, yet by the time I’m done trying to mold my mini-mes into self-sufficient decent human beings who feel loved and understood, I’m just too mentally and physically exhausted to do anything but zone out to the world and keep ignoring everything I’ve put on the back burner. So I remind myself that this time in their lives where they actually want me to be a part of everything they do is short-lived and that my time is better spent sharing life with them even if it costs me my own. I was reading to my daughter like we do every night before bed. She interrupted me like she does every night, but this time she said something that caught me off guard. She said a kid called her weird. She sounded so sad, and for a minute, I was too. My first reaction was to tell her to ignore this kid, but I paused and tried to think of something better, something that would help her for the next time it happens. I told her that being weird is a good thing. It means you’re not like anyone else. So the next time someone calls you weird, you should say thank you. She laughed a delighted little giggle and I felt good, like I’d said the right thing at the right time. As I was reveling in my parental sense of accomplishment, my daughter turned over, laughed again, and deliberately farted on me. I couldn’t sum up parenthood more perfectly if I tried. If there was an award for world’s pickiest eater, I would’ve held the title when I was growing up. It drove my mom to the edge, and now my daughter is exactly the same. There are a handful of things she’ll eat: peanut butter sandwiches, no jelly, just peanut butter, which isn’t crazy, but still, c’mon. She won’t eat hamburgers or hot dogs, but she’ll eat the buns and even dip them in ketchup which sounds repulsive, but I did it too when I was little. She’ll eat string cheese but not mac & cheese, no pizza, no grilled cheese, not even spaghetti. None of the “normal” things that kids eat. She’ll drink smoothies, and eat an entire carton of raspberries in one sitting, but god forbid she even try a tiny bite of potato or carrot. And forget eggs unless they’re baked into a cake. The only thing that brings me hope is that I was the same, and today I eat way more than I did in my childhood. For me it was all about texture. I couldn’t eat anything slimy or chewy. There were many nights I had to sit at the dinner table alone because I refused to finish my pot roast or my broccoli smothered with mayonnaise…makes me gag just remembering. I used to tell my mom that certain foods gave me the shivers when I had to swallow them which makes me laugh now and think, god I was ridiculous and she must have been so frustrated with me. I’m ashamed to think of all the food I wasted. I wish I could give my kids the three-course dinner gum from Willy Wonka minus the whole turning into a giant blueberry part. Somebody please make that happen while my kids are still young. It would make dinner time so much easier. I wouldn’t have to cook a meal that no one will eat while simultaneously keeping my kids from killing each other and burning down the house in the process. It’s no wonder that there are people who love cooking and then there are parents.